Chihaya's Karuta club is finally complete. Starting at the lower left, and moving clockwise: Kanade Ooe, Taichi Mashima, Yuusei Nishida (AKA Nikuman, Porkbun), Tsutomu Komano (AKA Desk-tomu), and Chihaya Ayase. Episode 9 continues the excellent string of successes that has made Chihayafuru such a treat to watch. After finding the fifth member of the club, the big question was, “where is this show going from here”? With a combination of passion and comedy, this episode answered precisely that question. What Karuta looks like from the tatami mats' perspective. 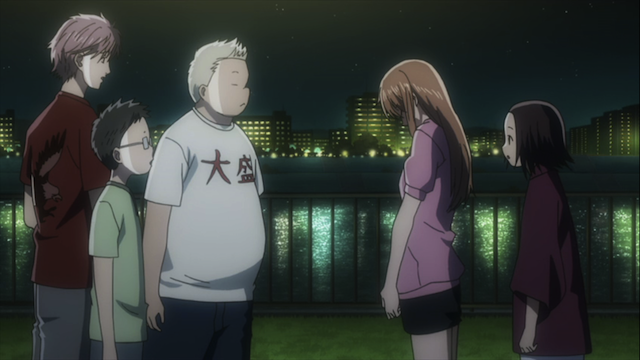 At first Nishida and Taichi agree that the focus will be on training Chihaya, but she will have none of it. She intends to train the rookies. Everyone thinks she is crazy or wasting her time. She won’t improve by playing the worst players, and they can’t possibly compete with her. She explains, however, that her goal is to enter the National Championship (the Karuta Matsuri) at the Omi Jingu shrine. And thus the path ahead for this series becomes clear. To go to the National Championship, they need to win the Tokyo (Kanto) Regional tournament first. Kanade manages to take her first card. A hard fought, and legitimate, victory. Given that Chihaya’s training philosophy can be summed up as “throw them in the deep end, if they don’t learn to swim fast, they’ll drown,” Kanade and Tsutomu manage to do pretty well. They are trying their best, and making some progress. Unfortunately there is no substitute for experience, so the question comes up as to how they can get in some extra games. It quickly becomes clear that the rookies need an opportunity to build up stamina, by playing a lot of games in a single day. 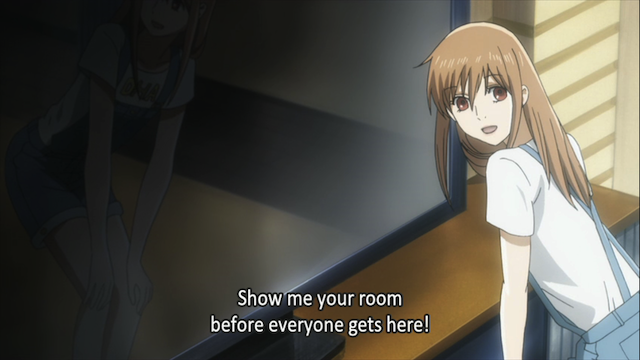 A training camp seems to be just the thing, and Chihaya invites herself and the whole club to a sleepover at Taichi’s house while his parents are out of town. Chihaya still has the mind of a child. She innocently still sees Taichi as nothing but a friend with whom she plays Karuta. 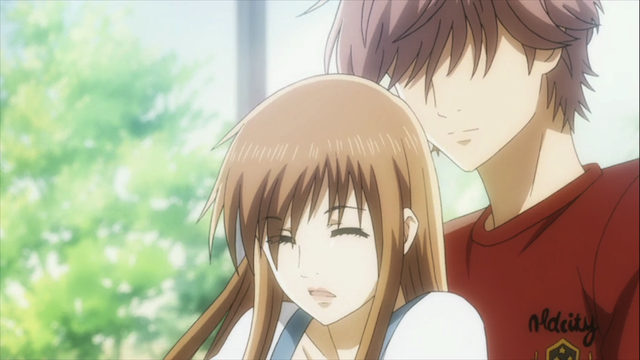 Taichi, however, sees Chihaya as a woman, and insists upon setting boundaries upon what they should be doing together. This leads to the first awkward moment between Chihaya and Taichi in this episode. At this point, it seemed more that she was surprised and confused at Taichi’s reaction. Hanging out in the room "Mrs. Pressure" keeps full of Taichi's various trophies. 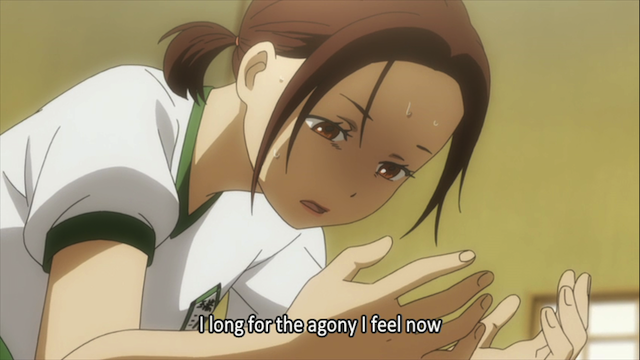 Kanade at the end of a grueling day of Karuta. 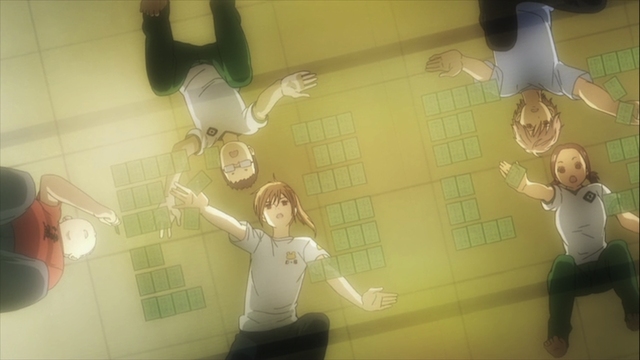 Chihaya forces the rookies to play Karuta non-stop until Taichi steps in and asks if she really means to break them. The poor things are even too exhausted to eat, and to make matters worse, Taichi’s mother, “Mrs. Pressure” returns home unexpectedly. 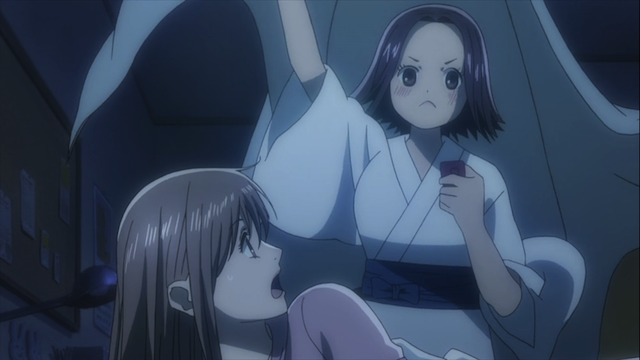 Chihaya flees with Kanade, asleep, riding upon her back. 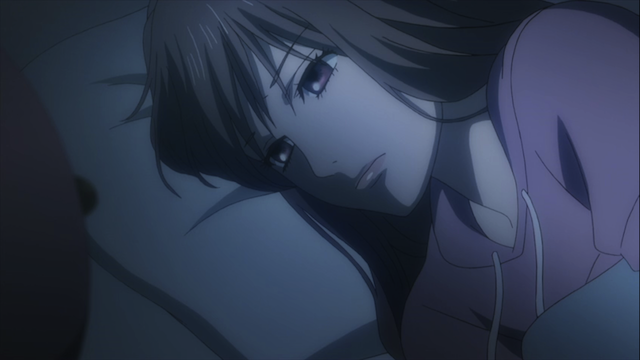 Chihaya Ayase tries to sleep, but has to wonder if she is really being the team captain that she wants to be. Is her love of Karuta blinding her to the needs of her team mates? Chihaya thinks they have snuggled in to bed for a good night's sleep, but Kanade has other plans. When she sees that she has been dragged out in the middle of the night to talk with the other members of the Karuta club, Chihaya apologizes for her behavior. She acknowledges that she has been pushing them very hard, and hopes they will forgive her. Well, needless to say, the apology might be appreciated, but it isn’t necessary. Everyone loves Chihaya precisely because she is so passionate about Karuta that she doesn’t seem to apply common sense. The real reason she was dragged out there was to wish her a happy 16th birthday. Taichi takes a mysterious phone message during the birthday proceedings. Chihaya X Taichi ~ "I see you as a woman" part two. When Taichi receives a mysterious text message, he seems to summon up a moment of courage, and we get the second awkward moment between Taichi and Chihaya. A lot happened in just a few moments, so let me unpack it a bit. First, Taichi, troubled by the mail, seems ready to close and forget it, until he hears Chihaya’s voice. She is just joking around as usual, but Taichi takes matters very seriously for a moment, grabs her, and eats the last bite of lemon tart off her spoon — an action that brings their mouths almost into contact. The action is almost sexual and certainly possessive. Chihaya may not fully understand it, but she does seem to have been shocked out of her obliviousness. 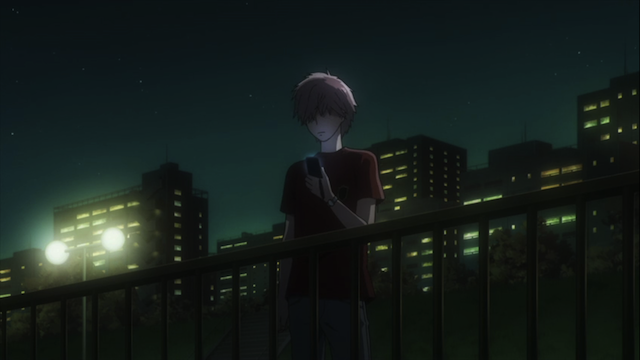 Then Taichi hands over the phone so she can read the mail, which is, of course from Arata. Chihaya is overjoyed at the message, but I don’t think that means she has made a choice. I doubt she really has consciously thought about her feelings for either boy. 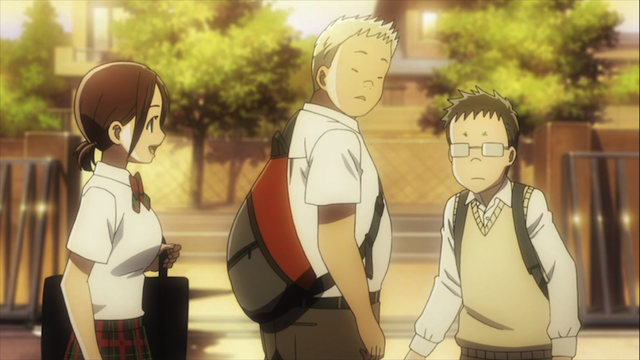 On the other hand, Taichi went through a whole range of emotions, a flash of panic, perhaps, as Arata’s specter emerged, momentary cowardice, as he thought maybe he could just pretend that he “forgot” to deliver the message, jealousy and desire as he forcefully held Chihaya and demonstrated that he was the one standing in front of her, not Arata, and finally, what? triumph? humility? friendship? as he handed the phone over to Chihaya so she could read Arata’s birthday message for herself. I know there are those who wish Arata would return in person, but I’m enjoying this way of handling the relationship between the three. Taichi must feel he can never win against Arata, who is remembered as almost a mythical figure. It isn’t uncommon for the female lead to fall in love with a non-existent “prince” who seems to embody all virtue, thus making the real men around her appear inferior. Sometimes this idealized version even manages to diminish the real version of the same person, such as in The Shop Around The Corner, or as in a show I recently re-watched Library Wars (Toshokan Sensou). So this isn’t entirely original, but it does add tension, and who knows what will happen when the inevitable reunion takes place. I absolutely loved the scene at the end. It really came out of nowhere with the whole episode revolving around playing karuta, companionship, and understanding. It had a relaxed feel the entire time. But then this scene came up with its wide range of emotions and implications and shattered that gentle atmosphere. We got a good look beneath the surface of Taichi here, seeing his true emotions and his actions. And we saw how Chihaya sees it all, too, or rather how she still remains oblivious to the difference between love and friendship. And it brings up Arata again who might not have been in our minds all episode either. It was a burst of brilliant flavors right at the end of the episode which brought us back to the reality of this series and the three main characters. Easily my favorite scene of the anime and a perfect example of why it’s one of my favorites. What I think Taichi felt at the end when he handed Chihaya the cell phone was a mix of defeat and kindness. It’s easy to see the emotions he’s going through there but it’s really hard to define, which is why I’m having trouble pinpointing the exact emotion he had when he did what noble act he did. Like you mentioned, humility and friendship work there, too. Yeah, and I think it is possible that he had a mixture of emotions at that moment. One the one hand, Arata sends a single text and it seems to weigh about as much as all the work Taichi went through to put together the party. On the other, he is there with her and Arata isn’t which has to count for something. Relationship triangle is still in full swing though Taichi being graceful enough to hand the text message over makes this triangle an interesting one to savor. Also, Chihaya is totally not the right person to be given a leadership role and whether it was intentional or no, the adviser made a good call there. 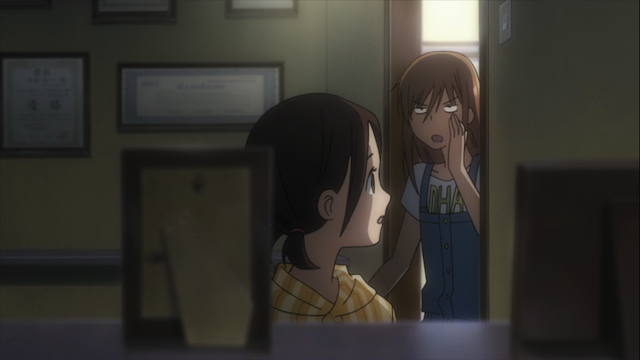 Honestly I often take the Chihaya approach to teaching. Total Submersion. The way I figure it, people won’t necessarily pick up all the details, but they will probably pick up something. At least in my case, I often don’t get things until the second time around. So I figure, the first time through people should expect to be overwhelmed. The real point is to cover a lot of stuff really fast, so that the next time they hear it, they might think, “hey, I’ve heard of that before”! Yeah, the advisor’s role is interesting. She almost seems hostile to the group, but then Chihaya probably wasn’t the best choice for president. 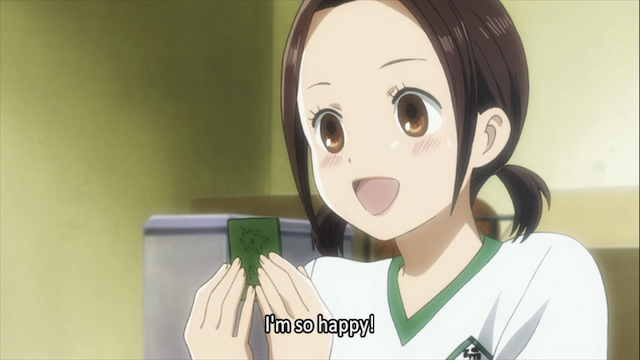 We don’t know a lot about “the Empress”, but she had to have been impressed that Chihaya got the two smartest kids in the grade to join, and she personally witnessed Nishida dropping the Tennis team for Karuta. I bet Kanade is a decent student, too. They’re not all screw-ups like Chihaya. I do wish Arata would return, but with how it’s going, it doesn’t seem like he’ll just burst out of nowhere anytime soon. Usually I hate it when a character I like is physically absent for a while, but I have to admit that with this show, it’s handled very well. It was definitely the classier move — and, to an extent, the braver move, so, yeah, thumbs up for Taichi. Madhouse is really handling the pacing well, being close to the manga. Even if I would give anything to see Arata back, he won’t be transferring anytime soon. Now I’m liking the Taichi angle way more because he shows so much conflict and emotions. The person who is near you, wins through proximity but Arata overshadows everything so much that even thinking about him gives people chills (like Porky-kun). For me the best thing would be to see Chihaya become a Queen and Taichi an A-rank player in the process, actually fighting for her rather than cowering in Arata’s shadow. Yeah, I rather like Arata as a mythical Demon-king. It is amusing to think that memories of a 12 year old, four eyed, kid cause so many to tremble in fear. I hope Taichi becomes an A-ranked player as well. I really, REALLY disliked him in the beginning, but I like the development he has gone through. He truly has grown into a better person as he got older. Regardless of how things turn out with Arata (and Chihaya), I would like him to have a moment of Karuta victory. maybe I’m reading too much into it, but perhaps, what Taichi was thinking when he eventually showed Chihaya the text (and not only showed her, but allowed her to spend time “alone” with it) was that if he was going to battle against Arata for Chihaya’s heart, he was going to play fair – no deception, no lies, no cheating. and if this is true, it ties back to when he first went up against Arata and stole his glasses for a more “equal” playing ground. I also don’t think Chihaya’s reaction to Arata’s text message-via-Taichi’s phone (which was an interesting move indeed) means she’s made a choice between the two either. you were so right when you said that Chihaya’s mindset is still childish, and this is the biggest and most troublesome monkey wrench in Taichi’s love plans. he needs to figure out a way to reach Chihaya properly and I really believe it’s all going to come down to Karuta: Taichi versus Arata; winner takes ALL! We’ll have to wait and see what happens. 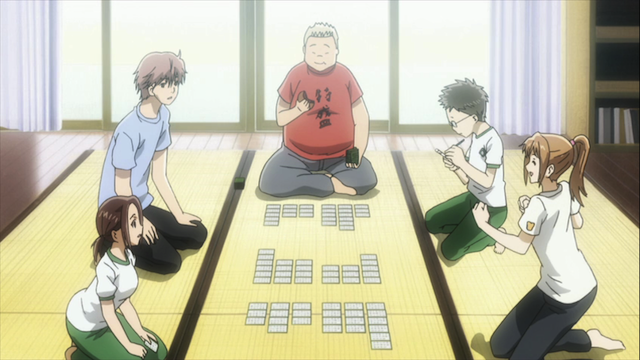 I do think Taichi’s decision to join the Karuta club was a good one, though. It gives him a lot of opportunities to develop his relationship with Chihaya, but he will need to be more than dependable Taichi; he also needs to make it clear to her how he feels.